LINCOLN, Neb. — Nebraska made history Sunday night, setting a program record for conference wins and winning 22 games overall for just the third time in school history with its 76-64 victory over Penn State. Nebraska (22-9, 13-5 Big Ten) clinched the No. 4 seed and double-bye into the quarterfinals of next week’s conference tournament. The Huskers kept hopes alive for their first NCAA Tournament berth since 2014. Penn State will take on Northwestern on Thursday. The Lions could have earned a double-bye into the quarters with a victory. The Huskers, who led by 17 at half, stretched their advantage to 49-28 on Gill’s 3-pointer with about 13 minutes remaining. Then Penn State (19-10, 9-9) began to chip away at the lead behind Tony Carr, who had 19 of his 27 points in the second half. 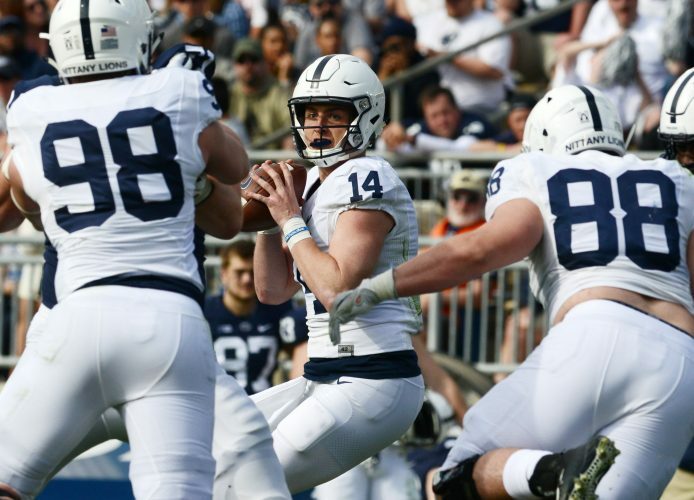 The Nittany Lions cut the Nebraska advantage to 12 six times in the last 4:13, but got no closer. Nebraska took control with a 17-3 first-half run, highlighted by three straight baby hooks by Jordy Tshimanga, going up 25-10 on Copeland’s basket with 6:44 left in the half. The Huskers had a 46-28 edge in points in the paint and outrebounded Penn State 45-28. Isaiah Roby had 13 points for Nebraska and James Palmer Jr. and Glynn Watson Jr. had 11 points each. Lamar Stevens had 13 points for Penn State and Shep Garner added 11. Nebraska: With Sunday’s win, the Huskers broke the school record for most conference wins in a season at 13. The previous mark of 12 conference wins was set in 1965-66 when Nebraska played in the Big Eight Conference and in 1915-16 when the Huskers were a member of the Missouri Valley Conference. Nebraska was undefeated at home in conference play for the ninth time in school history. Penn State: The Nittany Lions played without Mike Watkins, the team’s second leading scorer, who had 20 points and 15 rebounds in Penn State’s 76-74 overtime win over Nebraska in State College on Jan. 12. Nebraska will play in the conference tournament quarterfinals Friday. PENN STATE (19-12): Stevens 5-11 2-4 13, Moore 1-2 0-0 2, Reaves 1-8 1-2 3, Garner 5-8 0-0 11, Carr 9-23 7-11 27, Harrar 0-0 0-0 0, Pierce 0-1 0-0 0, Wheeler 1-1 2-2 4, Bostick 2-5 0-0 4. Totals 24-59 12-19 64. NEBRASKA (22-9): Copeland 6-10 3-5 17, Okeke 0-0 0-0 0, Palmer 5-12 1-3 11, Taylor 2-8 3-4 7, Gill 2-6 3-4 9, Roby 5-6 3-4 13, Tshimanga 4-6 0-0 8, Laws 0-1 0-0 0, Watson 4-8 3-3 11, Allen 0-0 0-0 0. Totals 28-57 16-23 76. Halftime–Nebraska 34-17. 3-Point Goals–Penn St. 4-17 (Carr 2-7, Stevens 1-2, Garner 1-4, Bostick 0-1, Reaves 0-3), Nebraska 4-13 (Copeland 2-3, Gill 2-5, Laws 0-1, Taylor 0-1, Palmer 0-3). Fouled Out–Roby. Rebounds–Penn St. 25 (Reaves, Stevens 7), Nebraska 41 (Copeland 12). Assists–Penn St. 6 (Reaves 3), Nebraska 16 (Copeland 4). Total Fouls–Penn St. 19, Nebraska 14. Technicals–Palmer.